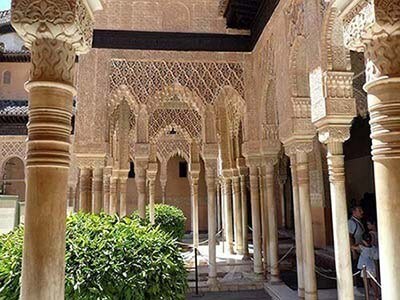 Visit the Alhambra Palace in Granada Spain and Tickets: Best tips for visiting the Fort with the Generalife Gardens: Opening Hours, Buying Tickets for this Moorish Alhambra Palace in the Spanish City of Granada, Andalusia. You can opt for a 20-minute walk (see bottom of page), taxi / car (parking info see below), bus C3: Alhambra - Plaza Isabel La Católica or take a taxi from the city centre for about 7 euros. How to buy your Alhambra tickets? Recommendation: Are you also visiting other tourist attractions in Granada and will you be using public transport? The € 49,- AlhambraCard is cheaper. Additionally, this provider has the most tickets available in the short term. You can easily buy your AlhambraCard here. Coming by car? Book here your AlhambraCard including a parking spot. Do you want to visit the palace with a guide? Then order your tickets on Ticketbar or on Tiqets. Try this website, this tour or this tour with differents dates for a guided tour. You can also book these morning tickets; note, these don not include the Nasrid Palace. 15 October - 31 March: Daily from 8:30 - 18:00. Evening visits Friday and Saturday 20:00 - 21:30. 1 April - 14 October: Daily from 8:30 - 20:00. Evening visits Tuesday and Saturday 22:00 - 23:30. The Alhambra is a medieval fortress and palace in Granada and certainly one of Spain's highlights. The palace complex of the Alhambra originates from the period of Moorish conquest (Nasrid sultans) and means qasr alhamrā in Arabic, or the Red Palace. The red colour comes from the red clay the stones mixed in with the stones and in the softer evening light, they give the building complex a beautiful dark red colour. 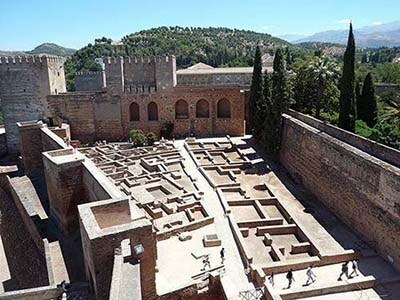 The fortress (Alcazaba) is situated strategically atop a hill and is clearly visible from Granada's city centre. Within the walls of the fortress, you will find stunning Arabic Nashrid palaces, the lovely gardens of summer palace Generalife, imposing Christian churches and medieval towers. This 'city within a city' was built in the 13th century by the Moors on Sabika hill in Granada. After the Catholic royal couple conquered the city of Granada from the Moors in 1492, this palace was also taken in possession. In 1526, their grandson Charles V commissioned the construction of a renaissance style palace in the centre of the Alhambra. A special feature of the Alhambra are the many marvellous Moorish decorations from the period of Yusuf I. Moreover, the palace has now been beautifully restored: Marble columns and floors, ceilings of fine woodcraft, walls with impressive calligraphies and transverse archways with geometric figures. 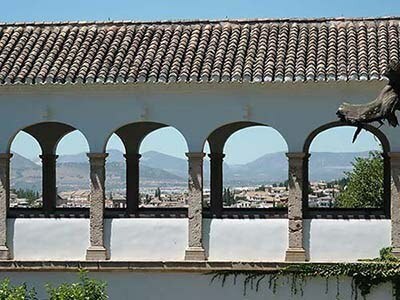 The Parador de Granada can also be found in the gardens of the Alhambra. This is the former monastery of San Francisco where, originally, the catholic kings were buried. 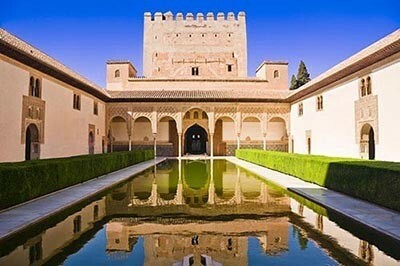 The Alhambra is the highlight of Granada and should certainly be part of your Granada city trip. You can spend a full day exploring the palace and its surrounding gardens. To be certain of tickets, it is necessary to buy tickets online in advance! Each half hour, for each time slot, only 300 people are allowed to visit the Alhambra-Nasrid palace. Buying tickets on location is almost impossible (only for tickets to visit the gardens). 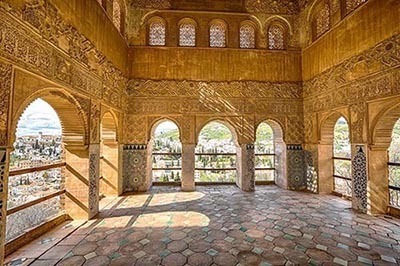 The Alhambra-tickets including the Nasrid Palace are often already sold out weeks in advance. Do not take any chances and buy your tickets in time so you don't miss one of Spain's major highlights! The Mexuar: The oldest part, where the sultan of Granada received his subordinates. In this reception hall, important decisions were made regarding legal and business affairs. Palacio de Comares: This is the sultan's palace which was built around the Patio de los Arrayanes. The water reservoir in the middle has a beautiful mirror-like function. In the palace, you will find several halls such as the ambassador's hall, the Sala de Barca and the Torre de Comares with nine bedrooms. 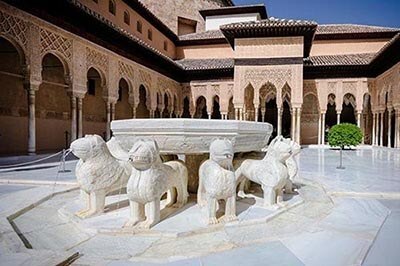 Palacio de los Leones: This Court of Lions palace from 1377 features a patio with an impressive marble fountain in the middle, which boasts twelve water-spouting lions and surrounded by the palace's 124 columns. The Court of Lions must surely be a reflection of paradise: the 124 white marble columns symbolise palm trees, the twelve lions symbolise the twelve zodiac signs and the four water canals leading to the fountain represent the four rivers of paradise. Around the patio, you can find the bedroom of the sultan and his wives and the Sala de los Reyes which is intended for large family gatherings. Mirador de Daraxa: The residence of the harem of the Sultan. Los baños: The impressive baths of the palace that were an important part of the Islamic tradition. 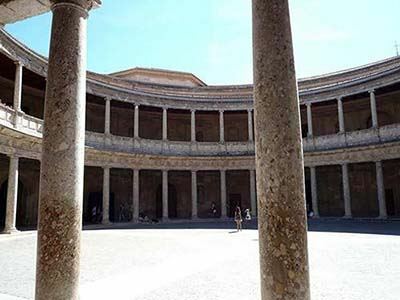 Palacio Carlos V: This gigantic square palace in Renaissance style was built in 1527 by order of Carlos V and lies in the centre of the Alhambra. This palace of Carlos V was built after the complex was reconquered from the Moors and the large circular courtyard with two column galleries is certainly striking. Generalife: The absolutely gorgeous gardens and adjacent summer palace where the sultans would find tranquillity between fountains, ponds and green terrace gardens in the Generalife summer palace. 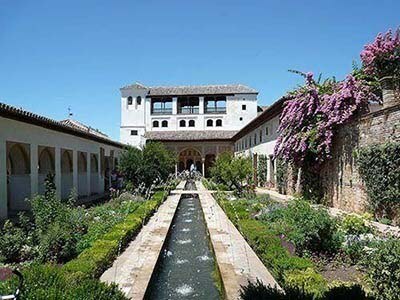 The many aromas of the herbs and vegetable garden complete the paradise-like experience of the Generalife gardens. Alcazar fortress: The military stronghold and fortress from the 11th century; double defensive walls and mighty towers had to protect the city. This fortress formed the first basis for the impregnable stronghold of the Moorish kings. 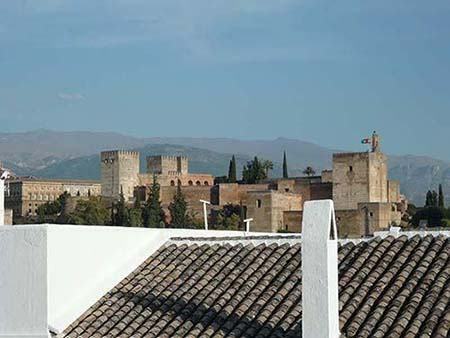 From the Torre de la Vela you have a splendid view over Granada, Sacromonte and the Albaicin District. How do I get to the Alhambra Palace? The Alhambra is just over a twenty-minute walk from Granada (for example Plaza Nueva and the Cathedral). From the centre it's almost a mile to reach the palace. You can climb the hill via two sides: via the Cuesta de Gomérez or when you are near the Albaicin-district via the Paseo de los Tristes. Parking near the entrance is possible, but pricey. At the Camino Viejo del Cementerio there is a large car park (accessible via Ronda Sur). Parking costs may be up to 3 euros per hour during high season. From the parking lot you can walk to the inner city in about 15 minutes.